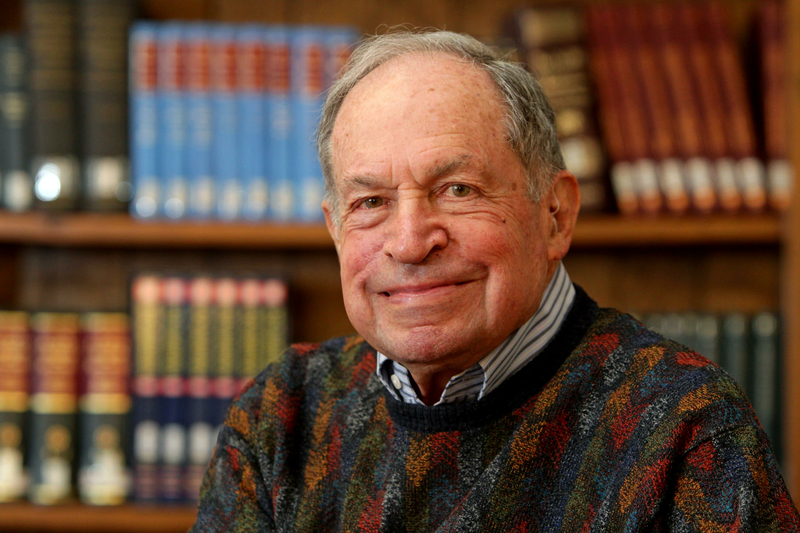 Center for Advanced Study Professor Emeritus of Physics and of Electrical and Computer Engineering David Pines, one of the foremost condensed matter theorists, died on May 3, 2018, in Urbana, Illinois. He was 93 years old. Pines is survived by his children Catherine Pines and Jonathan Pines, by his three grandchildren Josie, Tillie, and Maisie Pines, and by his sister Judith Fried. He was preceded in death by his wife Aronelle “Suzy” Pines (1925–2015). Pines made lasting contributions to condensed matter physics, establishing, with Bohm, the collective nature of electron-electron interactions in solids, which underlies the BCS theory of superconductivity; and to nuclear physics, contributing to our understanding of the collective motion in nuclei; and to theoretical astrophysics, providing early input on the structure and development of neutron stars. Pines ported new approaches across disciplines to elucidate complex systems and emergent behavior, helping to chart the earliest course of inquiry in many-body physics. He was internationally recognized not only for his significant research contributions, but also for the key role he played in bringing scientists together to explore the most pressing scientific questions of his time. He was the founding director of the Center for Advanced Study (1967–1970) at the University of Illinois at Urbana-Champaign. He served as vice president of the Aspen Center for Physics from 1968 to 1972. He was one of the key organizers and founding members of the Santa Fe Institute (SFI) in 1984; he later played a variety of organizational roles for the institute, most recently holding the title of co-founder in residence. And in 1999, he co-founded the Institute for Complex Adaptive Matter, a virtual campus collective of scientists, and served as its first director and on its board of trustees and science steering committee; in 2004, he cofounded its international component I2CAM. And from 2005, Pines held an appointment as distinguished professor of physics at the University of California, Davis. Pines was a dedicated teacher and his work as an author and editor likewise facilitated scientific advances in several branches of physics. In addition to producing hundreds of peer-reviewed scientific articles, Pines was the founding editor (1961–1981) of Frontiers in Physics, a lecture-note and reprint series that delivered leading-edge science to a broad audience; 53 volumes were published. He served as editor of the American Physical Society’s Reviews of Modern Physics (1973–1996), reinvigorating the publication and making it one of today’s leading physics journals. And he served many years on the editorial boards of the Journal of Physics and Chemistry of Solids and of the SFI’s Studies in the Sciences of Complexity. Pines’s physics textbooks have been widely used in the US and abroad. Because of his focus on communicating complex science through basic concepts, these volumes are still relevant to the teaching of physics today: The Many-Body Problem (1961; in Russian, 1963); Elementary Excitations in Solids, (1963; in Russian 1965; in Japanese, 1974); and Theory of Quantum Liquids first published in (1967; in Russian, 1968). With economics Nobel laureate Kenneth Arrow and Philip W. Anderson, Pines edited the volume The Economy as a Complex Evolving System, summarizing a series of SFI workshops on complexity economics. Pines was born on June 8, 1924, in Kansas City Missouri to Sidney and Edith (née Adelman) Pines. He attended Highland Park High School in Dallas, graduating in 1940 just before his sixteenth birthday. He enrolled in a small experimental liberal arts college, Black Mountain College, in Asheville, NC, for one year, before transferring to University of California, Berkeley. As a result of that interaction, Pines signed up for physics courses at Berkeley. However, he wasn’t truly inspired by the subject until he took quantum mechanics with Dr. Joseph Weinberg, who had been a doctoral student of Robert Oppenheimer. Oppenheimer was serving in a leadership role in the Manhattan Project at Los Alamos at the time, but Pines was inspired by him through the stories Weinberg told. Pines received his bachelor’s degree in physics from UC Berkeley in 1944 and enrolled in the graduate program at Berkeley, hoping to work with Oppenheimer himself. After his first semester of coursework, Pines was drafted into the Navy and served two years. He returned to Berkeley in 1946. Oppenheimer had at that time also returned, and Pines found in him a great mentor. In 1947, Pines followed Oppenheimer to Princeton University, where Oppenheimer had accepted a position as director of the Institute for Advanced Study. In the end, Oppenheimer’s obligations as a leading scientific adviser on U.S. policy turned his attention away from research, so Pines asked one of Oppenheimer’s former students, David Bohm, to be his thesis adviser. A noted theoretical physicist in his own right, Bohm happened to be Pines’s roommate at the time. With Bohm, Pines undertook his first work on many-body systems, focused on electron interactions in a dense gas. Pines received his master’s (1948) and doctoral (1950) degrees in physics from Princeton. He then planned a series of three scientific papers with Bohm, based on his doctoral thesis. But in December of the same year, Bohm’s U.S. scientific career came to an abrupt conclusion; under the toxic climate of McCarthyism, Bohm was investigated by the House Un-American Activities Committee. Suspected of Communist Party ties, he was indicted in a federal court. Though he would later be acquitted, Bohm lost his position at Princeton and could obtain no other academic posts in the U.S. Bohm joined the faculty at University of São Paulo in Brazil in 1952. In the meantime, Pines worked as an instructor for 18 months at the University of Pennsylvania, prior to coming to the U of I as John Bardeen’s first postdoc, with the academic title research assistant professor. This work prepared the way for Pines and Bardeen’s work on electron-lattice coupling in metals, and then on electron-phonon coupling in metals. Pines’s work under Bardeen between 1952 and 1955 would form the underpinnings of the Nobel prize-winning work a later graduate student, Bob Schrieffer, did under Bardeen. Schrieffer’s invention of the wave function for the superconducting ground state in 1957 was directly inspired by Pines’s wave function. The third paper coauthored with Bohm was written in 1953, via an exchange of letters between Urbana and São Paulo. In it, they introduced the random phase approximation (RPA), now widely used in many-body physics. From 1955 to 1958, Pines joined the faculty at Princeton as an assistant professor. In 1957, he embarked on a 15-month combined Guggenheim and National Science Foundation fellowship in Europe, spending the summer at the Bohr Institute and the academic year at the École Normale Supérieure. At the Bohr Institute, he collaborated with Aage Niels Bohr and Ben Roy Mottelson, introducing them to the theory of superconductivity by showing the relevance of these concepts to pairing in nuclear physics. The paper by Bohr, Mottelson, and Pines on a possible analogy between the excitation spectra of nuclei and those of the superconducting metallic state represents the first-ever application of BCS concepts to nuclear physics. This work laid the foundation for the 1975 Nobel Prize-winning work by Bohr, Mottelson, and Leo James Rainwater on the connection between collective motion and particle motion in atomic nuclei, and the theory based on this connection. At the invitation of Oppenheimer, Pines spent 1958/59 as a visiting member of the Institute for Advanced Study, where he collaborated on developing a microscopic understanding of superfluid helium-4. In 1959, Pines joined the faculty at the U of I as a professor of physics and electrical engineering; here he would spend most of his academic career. His office was next door to that of John Bardeen. Pines served his scientific community as a member of advisory boards, boards of trustees, and organizing committees, in too many roles to list here. A partial list includes his work with the Association of Universities for Research in Astronomy, The Institute for Theoretical Physics in Santa Barbara, the Joint US–USSR Commission on Scientific and Technological Cooperation, Los Alamos Scientific Laboratory, the National Academy of Science’s National Research Council. Pines often took the lead in organizing scientific symposia, workshops, and exchanges of scientists. He was a great proponent of building a US–USSR scientific cooperation, starting in the post-war era, when Jewish scientists were heavily discriminated against. Pines chaired the Board on International Scientific Exchange (1973–1977) and co-chaired the US–USSR Commission on Cooperation in Physics (1975–1980) of the National Research Council. He was also instrumental in securing several faculty exchanges for Russian scientists at the U of I at the end of the Cold War. Pines was the recipient of numerous honors over the course of his long and productive career. He was elected a member of the National Academy of Sciences and of the American Philosophical Society; he was elected a Fellow of the American Academy of Arts and Sciences, of the American Association for the Advancement of Science, of the American Astronomical Society, and of the American Physical Society. He was an honorary member of the Hungarian Academy of Sciences and a foreign member of the Russian Academy of Sciences and of the Science Academy Society of Turkey. He was selected a Fellow of the J.S. Guggenheim Memorial Foundation (1962 and 1969); won the 1983 Friemann Prize in Condensed Matter Physics; was awarded the 1984 Dirac Silver Medal for the Advancement of Theoretical Physics and the 1993 Tau Beta Pi Daniel C. Drucker Eminent Faculty Award of the U of I College of Engineering; was conferred an honorary degree from the University of St. Andrews in Scotland (2009); received the 2009 John Bardeen Prize of the International Conference on the Materials and Mechanisms of Superconductivity; and received the 2013 John David Jackson Excellence in Graduate Physics Education Award of the American Association of Physics Teachers.